Last month we converted to a dynamo system for lighting. Got the SON XS hub wheel, SON Edelux II LED Headlight (Gold) & B & M Toplight LineTec Brake Plus Rear Dynamo Light for BBB. But what I didn't know at the time of ordering was that BBB needs a 50mm fitting for the rear bracket for rear lights and had ordered the wrong size. So I had to exchange it for the proper size which took a little while. In any case I finally for it today and couldn't wait to fit it on BBB. So now BBB is fully dynamo powered lights. The B&M connects directly to the Edelux with the wire supplied with it so its just a case of routing the wire to allow for the fold and pushing it on the connectors. Setting the Edelux to automatic and the B&M will also come on. 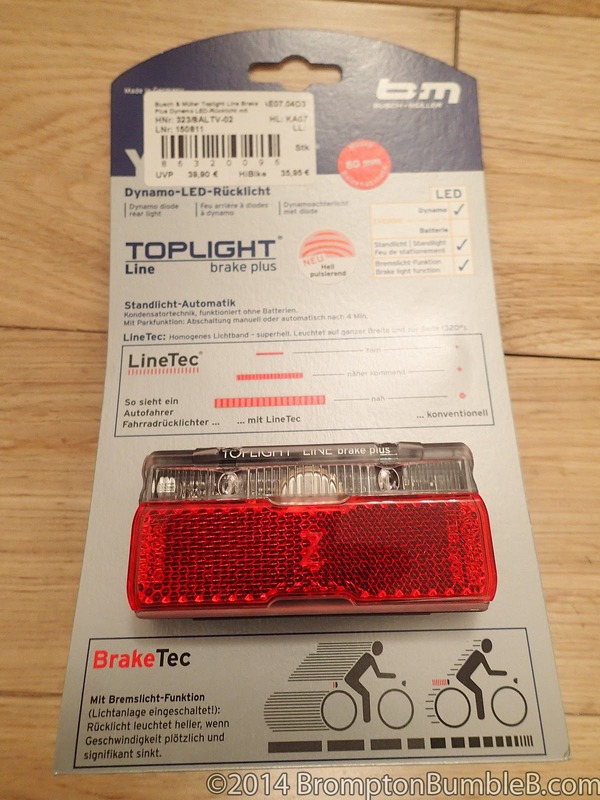 Designed and built in Germany the Toplight LineTec Brake Plus is very small - 16mm thick, 90mm wide and 44mm high. It fits into many spaces that previous lights would not fit! It has good all round visibility and is very light weight. 50 or 80mm fitting for pannier rack mounting. LineTec is a very clever concept developed by B&M. Before LineTec cars approaching a bicycle from behind could only see a single rear light spot without being able to judge the distance very accurately. To judge distance the human eye requires spacial relation - especially in 'spaceless' darkness. B&Ms lights with the LineTec light strip emit 'spatial' light. With LineTec other road users can estimate the distance to a cyclist much more accurately. BrakeTec - How does it work for bicycles? Motorised vehicles signal braking with bright shining red light to following traffic. This style of function is now available for bicycles. The new BrakeTec technology is integrated into rear B&M light. Unlike vehicles no connection is need to the brakes. 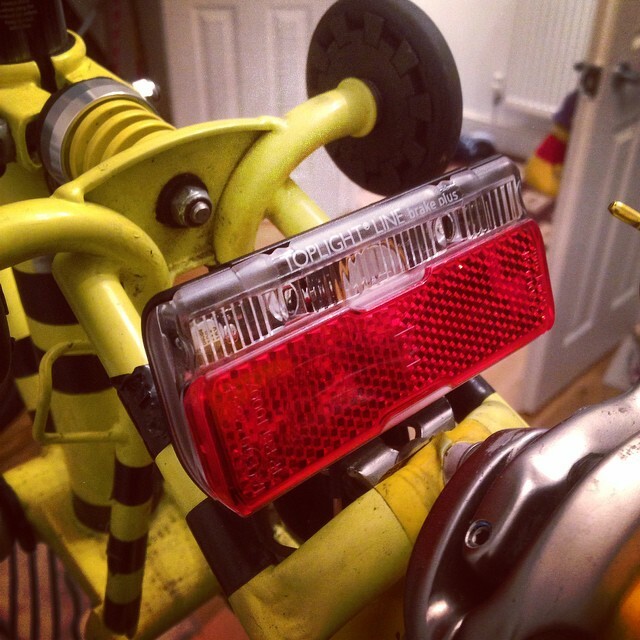 Simply exchange your existing rear light for a BrakeTec rear light. This new function is approved by German road traffic regulations. How does it work? Firstly your dynamo system needs to be operating. A processor inside the rear light analyses signals from the dynamo. If the velocity of the bicycle decreases significantly the processor registers deceleration and the rear light shines noticeably brighter. - Patented lighting technology - Made in Germany! Here is a little video I made demonstrating the "BrakeTec" function & how bright & wide the beam actually is in real life. The standlight I've noticed actually stays on much longer than the Edelux II.